Who can resist the appeal of pristine woods, cinematic meadows and gurgling streams of Roopkund trail! Call it Mystery Lake, Skeleton Lake or whatever that pampers your fantasy, but if you are an avid trekker you're bound to incline for Roopkund trek at least once in your trekking-lifetime! Roopkund, the serene, shallow, glacial Himalayan lake, located about five thousand meters above sea level is not the only charm of Uttarakhand that pulls thousands of trekkers every year, but, it's the combined appeal of pristine woods, cinematic meadows and gurgling streams that implants the seed of longing in a trekker's heart for this Roopkund trail. 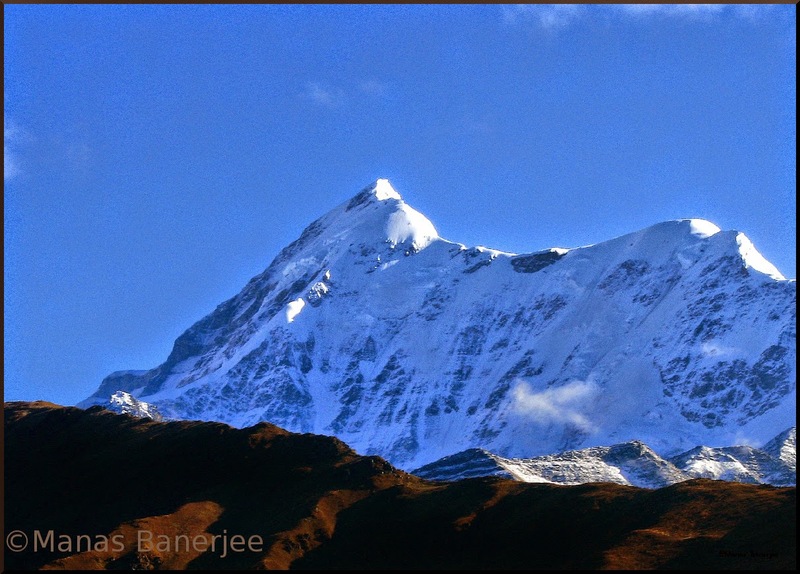 In this photo post I'm sharing beautiful photographs of few majestic snowy mountain peaks as seen in Roopkund trek. 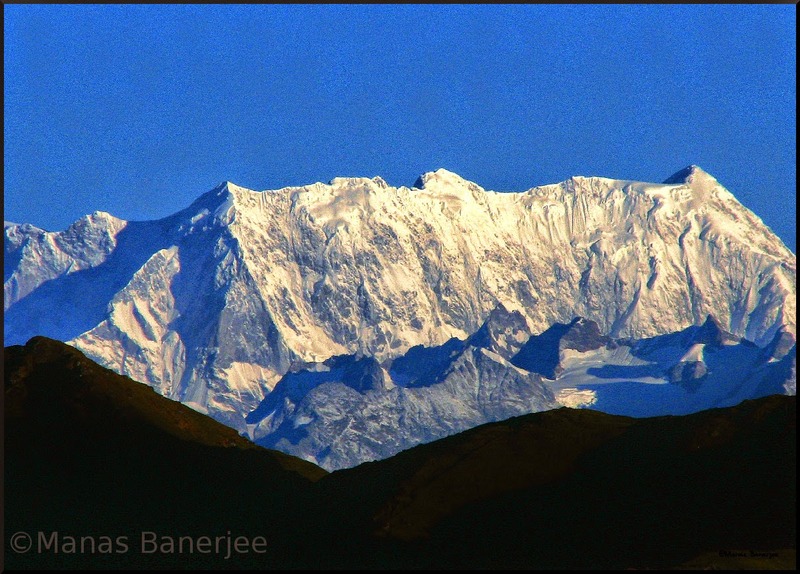 Today's photographer is Manas Banerjee, a passionate wanderer since 1996. Manas is smart enough to carry a point and shoot camera along with his DSLR whenever he's traveling. 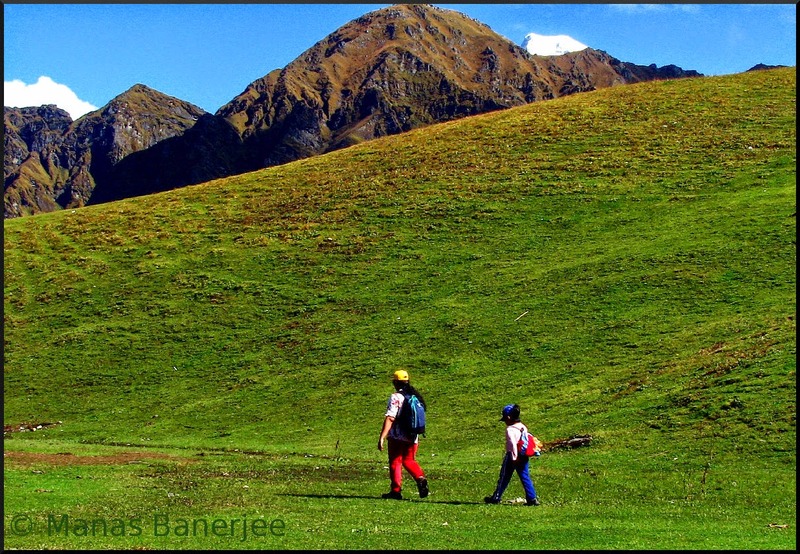 He had captured all these lively photos with his favorite Canon Powershot S3 IS, on his recent Roopkund trek. 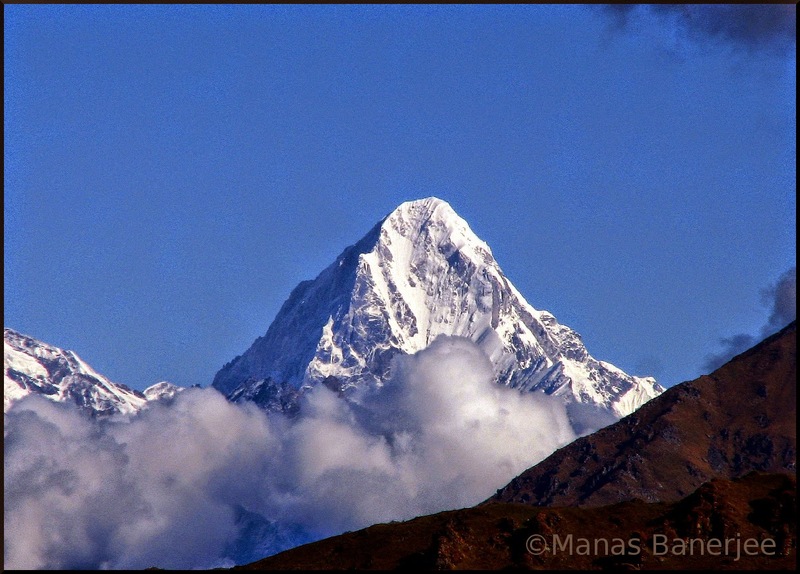 With its elevation of 6596 meters Neelkanth is a famous peak in the Garhwal division of the Himalayas. The Satopanth Glacier lies on the northwest of Mt. Neelkanth and the Panpatia Glacier lies on its southwest. According to a Hindu legend, Mount Neelkanth is none other than displeased Lord Shiva standing in the form of a lofty mass of rocks to block an old route between Kedarnath and Badrinath... interesting! Mount Chaukhamba celebrating a Himalayan sunrise! Mount Chaukhamba, another member of the Garhwal Himalayas, has four summits among which Chaukhamba I with an elevation of 7138 meters, lying at the head of the Gangotri Glacier is the most prominent one. Mount Nanda Ghunti is another member of the Garhwal Himalayas, with an altitude of 6309 meters giving good opportunity to catch its beauty to trekkers en route to Roopkund. It is so interesting the way a range of snowy peaks changes its color throughout the day. At one instance the massive mountain mass looks cold, unforgiving and misanthropic. Surprisingly, after a little time it may look inviting, adjustive and accommodative! Sun pulls the cord, yet we love to keep our imaginations limited to the reach of those glossy peaks. Mount Trisul as seen from the top of Junargali. 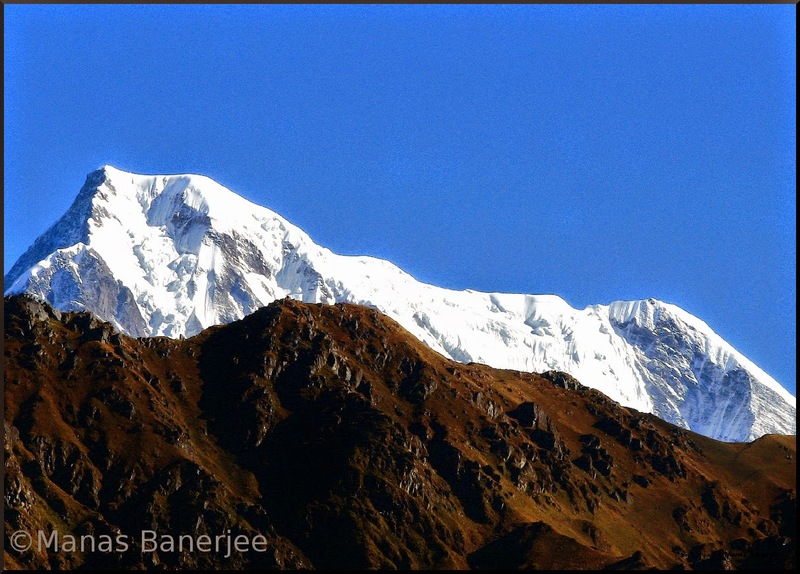 Besides Nanda Ghunti, Mount Trisul is another visual wonder for trekkers en route to Roopkund. Trisul, lying in western Kumaun, has three peaks as you can see in the photo above, the tallest one being Trisul I soaring at 7120 meters. No wonder, this mountain derived its name from Trishula, the weapon of Lord Shiva. Hope you loved Manas' clicks as much as I did... more on the way, watch out! A great round of applause for your friend Mr. Manas Banerjee....the photos are stunning! Absolutely gorgeous. When I trekked to Kedarnath, I had taken lot of pics with my point and shoot camera. Unfortunately, I don't have such beautiful pics to coney the beauty of nature. Anunoy, those pics are pathetic attempt by my inartistic photographic eyes. Sigh. Wow..the pics are fabulous. 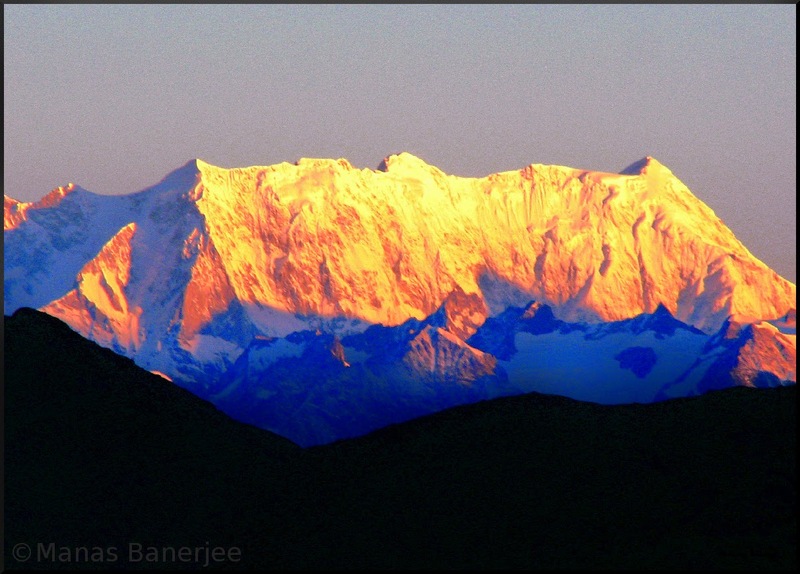 I love the pic of the Mount Chaukhamba,at Sunrise,the most. What a beauty. Good for you. If you start fantasizing,you will surely do it.